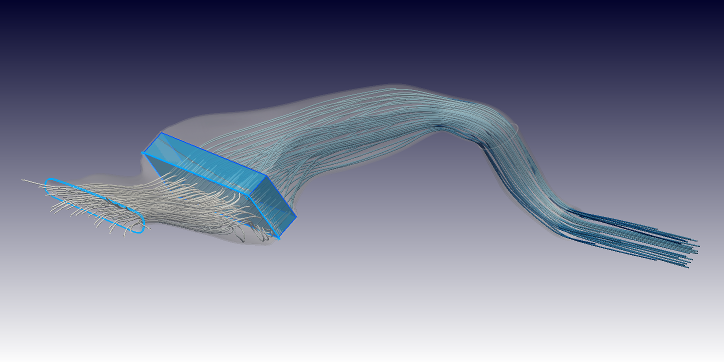 MantiumFlow is a CFD simulation tool that wraps around OpenFOAM ®. It sets up and post-processes cases, based on templates. This makes using OpenFOAM ® and CFD in general much easier, because the user only has to provide the geometry and select a template. It is much more than a simple OpenFOAM GUI as it takes care of setting up all boundary conditions, the mesh and post-processing. Under Linux, currently OpenFOAM ® versions 3.0.1, 4.0, 4.1, 5.0, v3.0+, v1606+, v1612+, 1706, 1712 are supported. Under Windows, blueCFD ® brings OpenFOAM ® to the platform with blueCFD-Core 2017-2 or the older version blueCFD-Core 2016-1 being supported. In addition it is possible to use a Docker version. CFD simulations made simple. The philosophy behind MantiumFlow is CAD in ➛ Report out. The user only has to provide his CAD files, select the CFD solver and a template for his desired simulation. MantiumFlow will take care of the rest. Add your CAD files as *.stl into a per-defined folder structure. Next, select your preferred CFD solver. Currently various OpenFOAM ® versions are supported. Other solvers will follow soon. MantiumFlow will prepare your CFD case and check if you made any implausible choices. After the case has been successfully created, hit the run button and have MantiumFlow run your case. MantiumFlow automatically post-processes the results and condenses them into an html-report. MantiumFlow was originally developed at MantiumCAE as a productivity tool to work with CFD software. It imports stl files and checks them and if a case is plausibly setup. If it detects issues they are reported. MantiumFlow also offers automated post-processing. Using this CFD simulation software, engineering time and errors are greatly reduced. Consequently MantiumCAE, the developer and main user, can offer very fast and cost effective CFD consulting services. The public version of MantiumFlow is connected to OpenFOAM ® and now available for purchase. Some people are reluctant to use open source software for many different reasons. What about using open source CFD software compared to proprietary software? Usually it is easier to use expensive CFD software as these solutions often use all kinds of numerical tricks to stabilize the solution. While on the one hand this might cause inaccuracies it does help to get results more reliably. However the engineer has to decide in how far the simulation was stabilized and in how far this affects the results. Often this is not revealed by the proprietary software. 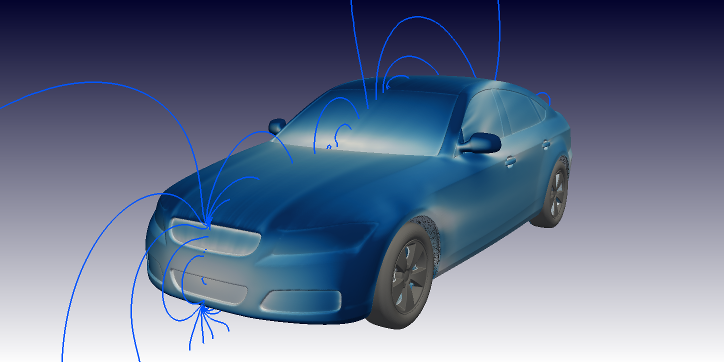 With OpenFOAM ® on the other hand, issues with the CFD simulation will cause the solver to crash. This means that a successful simulation was likely setup very well and delivers accurate results. Due to the open source nature of the CFD solver OpenFOAM ® advantages to licensing costs are especially relevant. There are none. This is very different from most proprietary CFD solutions as those often are payed in relation to the amount of CPU cores which are to be used for the simulations. With OpenFOAM ® there are no such limits. As a result the user can run as many simulations as he likes. Money saved on license costs can consequently be used to buy more computing power. MantiumFlow is so easy to use because many use-cases are automated with templates. To a certain extent the user can even create his own templates. If your use-case is not yet supported by MantiumFlow, we are very happy to talk to you about including it. 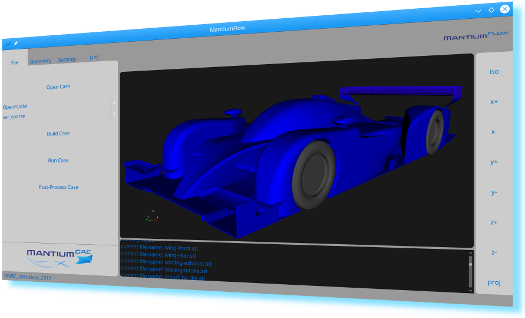 Run car simulations without having to assign mesh and boundary conditions to hundreds of parts. 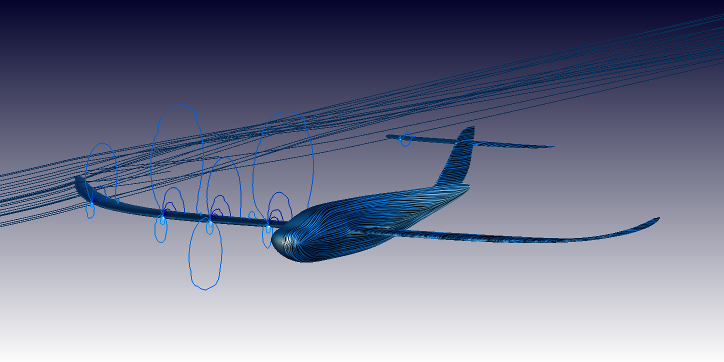 Simulate airborne vehicles. Again and again using the same settings thanks to templated cases. 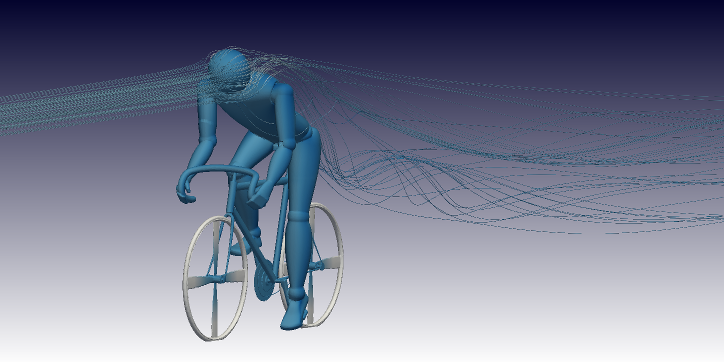 Develop bicycles and accessories like helmets without deep CFD knowledge. Simulate pumps, fans and duct flows. Even adjoint topology optimizations are available. MantiumFlow runs on Linux and Windows.